Getting the perfect nights sleep is more than just finding the perfect mattress. Some relatively easy care and maintenance can ensure your bed stays in prime condition to keep offering you the perfect nights sleep. Here we have all the details you need to ensure you care for your mattress as much as it cares for you! Many of our customers ask the question of how they should care and maintain their mattress. Whilst many know to ‘turn’ (flip it over so the underside becomes the top side) your traditional sprung mattress ‘regularly’ there is little information on how regular this should be. In terms of memory and hybrid foams the rules change slightly, as you don’t need to turn them due to their construction method. Here we have provided you with a guide for looking after and maintaining your new mattress. Why do I need to maintain my mattress? Just like a new car will over time get dirty and require washing and service once a year, your new mattress requires a similar, if less expensive kind of maintenance. Failure to look after your mattress will result in a reduced mattress lifespan. A lack of maintenance may result in your mattress getting dirty, suffering from inconsistencies such as isolated compression (one specific area being lower than the other), or the rare case of the mouldy mattress! 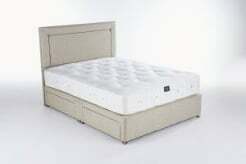 How often should I turn a latex mattress? If you have a solid core latex mattress like the fusion latex range, ie two-sided, we recommend you turn and rotate these once a month for the first year and then every two months thereafter. This helps even out wear and compression making your mattress last longer. The construction method of Memory foam means it does not need to be turned over. It also means that you can’t usually turn it like a traditional mattress. So rotating your mattress, spinning it around on the same side, once a month will allow you to distribute this wear more evenly. When we talk about rotating we mean spinning the mattress like the hands of a clock so the head end becomes the foot end and the foot end becomes the head end etc. We have covered in this article how the no turn benefit is really just down to the construction method. 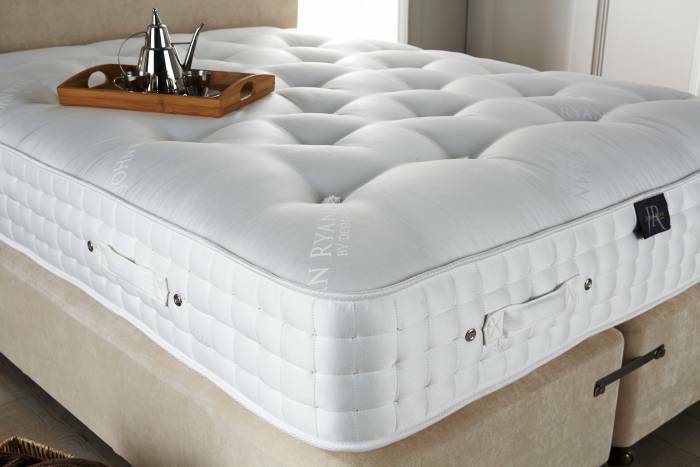 At John Ryan though we have crafted our beds to be either fully turnable in the case of the Fusion latex range, or partially turnable with our hybrid range. This means that the topper layer can be turned, flipped and rotated as often as you like. We recommend you do this once a month as well. So you can rotate the base mattress but turn/flip the topper. This again extends the life of your mattress and ensures consistency as it beds in and wears over time. Some customers, particularly with Super king size mattresses, have noted that a ridge can appear in the middle of the bed and are concerned this means the bed is sagging. John explains this as the Virgin Mattress Syndrome. This is where the centre of the bed receives little to no use so keeps its uncompressed state, whilst the two other sides compress slightly. Human nature means we are creatures of habit and tend to sleep in the same position every night meaning this area get more wear and compression than the rest. Regular turning and rotating can help with this. It doesn’t mean the mattress has sagged or dipped as in failed, it is just natural when you have two people using the same parts night on night. It is more of an aesthetic problem and not construction failure, if you have concerns please call us directly, though. This has occurred in a few instances online of certain mattress manufactures, naming no names! This usually occurs when maintenance is neglected and moisture is allowed to sit on the mattress especially in high humidity areas. Also when synthetic non-breathable fibres are used in a low-end mattress. Allowing moisture to sit and attract nasties like mould. Regular rotating and turning of the topper should prevent this. See our post here for more details on this. This issue is rare but as always we provide some advice on it! We can’t stress enough how valuable a mattress protector is. These can be purchased from most department and homeware shops. They are a slightly padded usually fitted sheet that goes over your mattress and topper. They are a cheap and easy way to prevent the 3 evils from damaging your mattress. If you don’t have a mattress protector a duvet sheet in the size of your mattress can be used as an alternative. The benefit is these can be removed washed or disposed of if necessary after periods of wear. They keep your mattress secure from the 3 evils that will over time damage them. Due to the depth of our full range of mattresses ranging from 18cm to 32cm in depth. Standard fitted sheets probably won’t suffice to keep your bed adequately covered. A number of high street shops sell deep and extra deep fitted sheets keeping your bed perfectly covered in whatever fabric, colour or design takes your fancy! Please note our depths are of the foam only and don’t include the covers. The cover can add 1cm-2cm to the depth along with the quilted undulations. We advise you double check once the mattress arrives before purchasing any specific depth fitted sheets. We don’t include the cover as we find it misleading to quote the cover as part of the foam. If you do by accident spill or wet your mattress our guidance is to take off the sheets as soon as possible and strip the mattress back to its core. Clean up any liquids with towels and then allow the mattress to air dry. Never use a heat source which could damage or warp the materials. Once it is fully dry re-make your bed with clean dry bedding and allow ventilation to ensure any residual moisture in the room or the bed can escape through evaporation. Stains may be a slightly different problem, we advise against using cleaning chemicals on the mattress for stains which may compromise the foam. This can lead to it becoming damaged or failing. If your bed is covered with a protector and sheets usually these can be washed with stain removers or simply replaced if beyond cleaning. We also need to stress that whilst it sometimes seen as a good idea to use a mattress as a toboggan down the stairs or a trampoline it will cause untold damages to the mattresses. This too is not covered by our guarantee as our mattresses are only guaranteed to be slept on. Whilst we agree it can be fun, we, unfortunately, can’t guarantee the mattress if they are used as an adventure playground! 1. Rotate your mattress monthly if one-sided. If two-sided like our latex fusion range then turn monthly. Turn and rotate the topper monthly. 3. Ensure that you have adequate ventilation, especially if you’re drying clothes on radiators or clothes horses. 4. Clean up spills as soon as possible and always allow a wet or soiled mattress to air dry once cleaned. Never use a heat source! 5. Deep fitted sheets will ensure all the lovely comfortable layers of your mattress are well covered and contained allowing you the perfect nights sleep! There are a lot of tips in this article about ensuring your mattress stays in as good a shape as possible. Monthly maintenance of turning and rotating is vital in ensuring that wear is evened out across the mattress and it goes without saying that any spills or liquids need to be cleaned as soon as to prevent damage to the internal components of your mattress.